The Reverend James C. Thomas is the son of Mr. and Mrs. James R. Thomas and a native of Beloit, Wisconsin. He grew up in the Emmanuel Baptist Church and was an active part of the youth and other ministries there. Reverend Thomas acknowledged his calling into the gospel ministry while attending Mississippi State University and was licensed into the ministry by Emmanuel in 1978. Following the leadership of his pastor (Dr. Floyd Prude Jr.), Reverend Thomas enrolled in the American Baptist College and received the degree of Bachelor of Arts in 1981. He was ordained by Emmanuel that same summer. Reverend Thomas continued his preparation for his ministry and the pastorate and enrolled in Vanderbilt Divinity School where he received the Master of Divinity Degree. 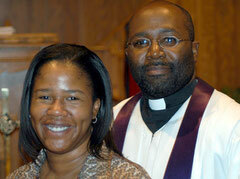 Reverend Thomas also holds a Master of Science Degree from Tennessee State University. His early ministry includes serving as an Associate Minister at Westwood Baptist Church: Interim pastor, Westwood Baptist Church (December 1986-June 1987) Nashville, TN; Associate Minister, First Baptist Church, Gallatin, TN; District Missionary, East Fork District Association; and Assistant Chaplain, Adrian College, Adrian Michigan. Prior to accepting the call to the pastorate of the Mt. Olivet Baptist Church, Reverend Thomas was the pastor of the Hopewell Baptist Church, of Nashville, TN for six years. Reverend Thomas is married to the former Andrea Denise Bishop and they are the proud parents of Israel Jedidiah, Immanuelle Imani, and Gabrielle Jai Grace.